Worship is at 9:00 AM on Sunday mornings at Cienega High School auditorium located at 12775 E. Mary Ann Cleveland Way in Vail, Arizona. Take Exit 279, Vail Road. Proceed north approximately 1 mile. Pass the Quickmart, Postoffice and two railroad tracks. Turn left at the signalized intersection onto Mary Ann Cleveland Way. The school is on the right approximately 1/2 mile. Take Houghton Road south to Mary Ann Cleveland Way. 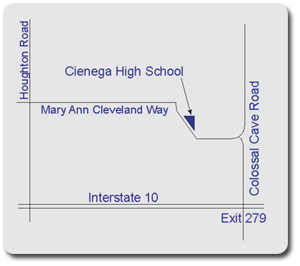 Turn Left (East) on Mary Ann Cleveland Way and proceed for approximately 4 miles.